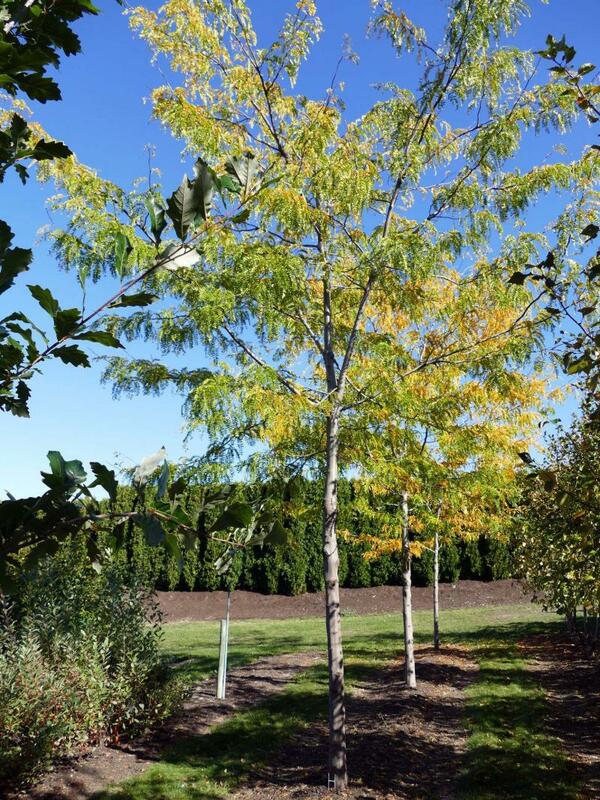 Northern Acclaim Thornless Honeylocust filters sunlight with its lacy, fernlike foliage. There’s no messy fruit drop with Starlite Flowering Crabapple. 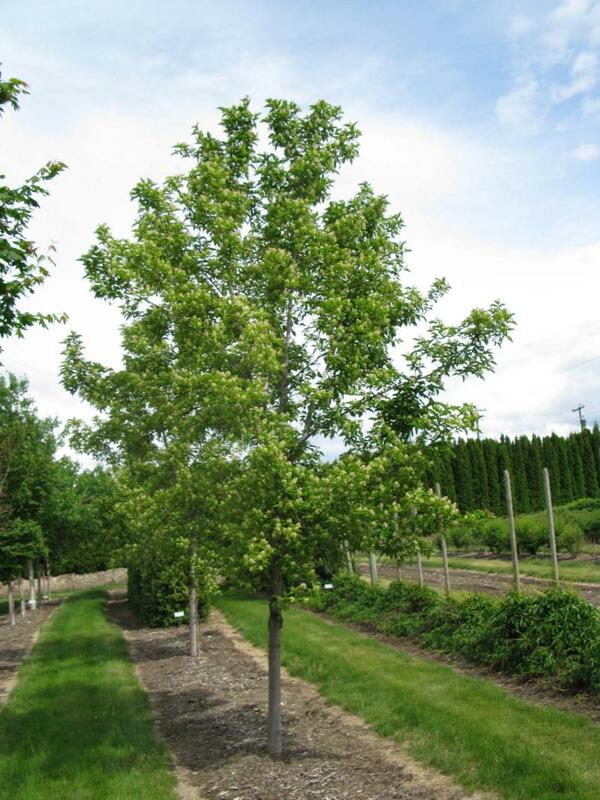 Rugged Charm Maple is a handsome tree that can tolerate part shade. At maturity, this newly planted Pagoda Dogwood tree will have distinctive tiers of horizontal branching. Need privacy screening? 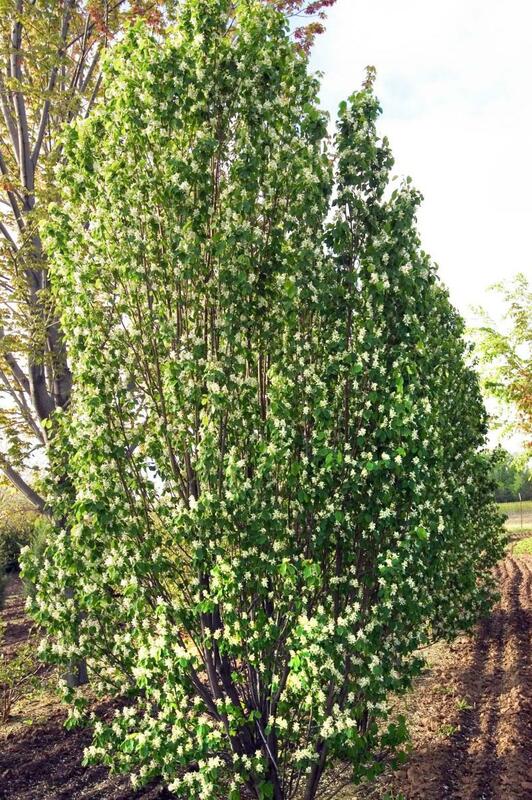 Standing Ovation Serviceberry is ideal for hedging. Trees are top of mind these days. With the news this week that Canada’s climate is warming rapidly and faster than the global average, the current prospect of losing a significant portion of Winnipeg’s mature urban forest to disease and infestation does little to ease our concerns. It’s not only Winnipeg, however, that is cutting down trees because it has no choice. Large swaths of Quebec and Ontario are also dealing with the destructive effects of emerald ash borer. In 2018, the presence of the pest was confirmed in Nova Scotia and New Brunswick. According to Natural Resources Canada, Canadian Forest Service scientists estimate that costs for treatment, removal and replacement of trees affected by emerald ash borer in Canadian municipalities may reach $2 billion over a 30-year period. All of us — from the three levels of government to arborist-activist groups and private property owners — need to embrace tree planting. With urban reforestation efforts underway in cities around the world, Matt Vinet makes a case for planting smaller trees (saplings) versus caliper trees (stem diameter that is more than 3.81 centimetres). Vinet is a certified ISA arborist and the ISA Prairie Chapter director for Manitoba. He is also a board member of Trees Winnipeg. "Many more trees could be planted if we switched to planting smaller-size trees," Vinet says. Municipalities and developers often plant caliper trees that are balled and burlapped (B&B) types. These are trees that have been established in the ground for a minimum of three or four years and harvested with specialized equipment. Their heavy root balls are secured with twine or wire. These larger wire-basket trees may have greater visual effect because they are older and larger and have a wider stem diameter than trees that are young saplings, but they are also far more expensive and consequently dictate that far fewer trees are planted. There are other downsides, Vinet says, to B&B trees. There is significant root damage (close to 90 per cent) that occurs to the fine, absorbing roots when B&B trees are harvested. The primary function of fine, absorbing roots, which are located in the top part of the soil, is to absorb water and nutrients. Their loss results in transplant shock. Regrowth of the feeder roots can take up to three years. Alternatively, Vinet says, bare-root trees that are established in the Missouri Gravel Bed system encourages the growth of lots of fine absorbing roots that make the trees ideal for transplanting so that they instantly begin absorbing water after planting and watering. This is a cost-effective method that extends the season of planting for bare-root trees. As well, container-grown trees that are planted properly and receive the necessary aftercare become well-established and grow quickly. All of this matters because the current rate of replacing trees on city boulevards is far behind the rate of removal. "We removed 12,000 trees in 2018 and are removing another 10,000 this year, but are planting fewer than 4,000," Vinet says. "That is not sustainable in any fashion." Vinet says we need to think differently by planting smaller trees in greater numbers. Cities such as Toronto, Vancouver, Milwaukee and Chicago are employing this strategy and making it work. Trees are being lost on private properties, too. 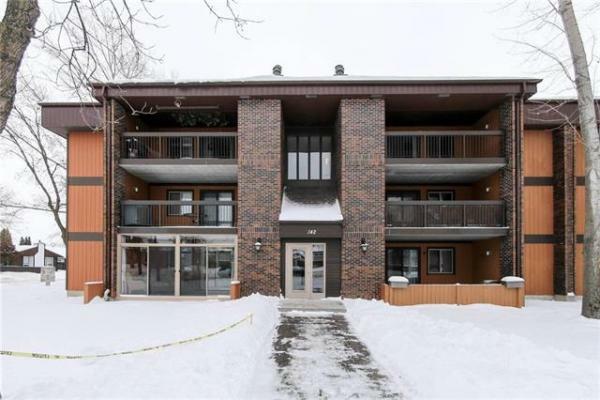 If we’re serious about reforestation in our neighbourhoods, why go for the Cadillac version of trees, which require costly assistance to install, when you can buy several small trees for the price of one and plant them yourself? Certainly, installing smaller trees is a strategy that is well-suited to homeowners with smaller properties and smaller budgets. With a reputation for a do-it-yourself culture, a little sweat equity by homeowners can go a long way in contributing to our urban forest. Trees Winnipeg’s ReLeaf tree planting program provides a tree planting workshop at the end of which you receive your choice of two trees. Depending on the variety you choose, the trees range in size from 1.2 metres to smaller shrub-forms. Yes, their size is small, but the cost is only $55, plus experts will teach you how to plant and care for your new trees so that they thrive. Planning to buy a tree this spring at your garden centre? Companies like Bylands Nurseries, Aubin Nurseries and Jeffries Nurseries are working harder than ever to bring a diversity of viable trees to the marketplace in order to help address the tree crisis affecting urban areas across the prairies. Rugged Charm Tatarian Maple is a compact specimen with an oval form. It has bright red seed wings that contrast with green foliage. Jan Pedersen, sales representative at Bylands Nurseries, says that part of the charm of this handsome tree is that it can tolerate a half-day of shade, as well as moist soil that is well-drained. Pagoda Dogwood is another compact tree that is tolerant of partial sun or part shade and suitable for growing near patios or decks. Pedersen has a Pagoda Dogwood on his Winnipeg property and points to a magnificent specimen that is planted next to the entrance of Oakridge Garden Centre in Steinbach. At maturity, the Pagoda Dogwood has distinctive tiers of horizontal branching. It has small, fragrant cream-coloured blooms in late spring followed by bluish-black fruits on showy red stalks. The fall colour is reddish-purple. Need privacy screening? 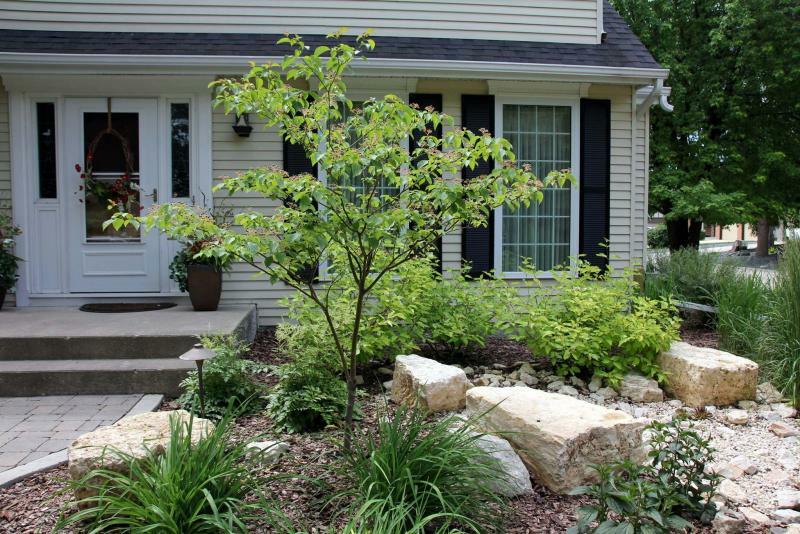 You can’t go wrong with a tall hedge of ­Standing Ovation Serviceberry, Pedersen says. Standing Ovation grows three to six metres high and just 90 to 120 cm wide. This slender tree has three-season interest — white flowers in spring, dark blue edible berries in June and beautiful red-orange fall colour. Plant several in a row for a living privacy fence. Northern Acclaim Thornless Honeylocust is a medium-sized tree, which filters the sunlight rather than producing heavy shade. It has an open lacy canopy with almost fern-like leaflets and a gentle, weeping habit which makes it quite attractive. This fast-growing cultivar was developed at North Dakota State University and has zone 3 winter hardiness, as well as good drought tolerance, Pedersen says. Starlite Flowering Crabapple (seven metres tall, two metres wide), is an excellent compact choice, Scott Peter of Aubin Nurseries says. 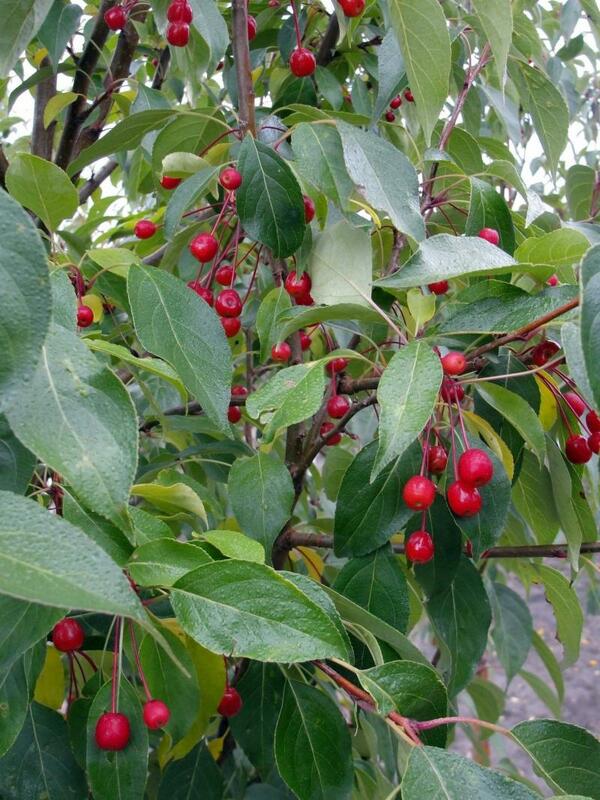 Starlite has great disease-resistance, an attractive vase-shape and very ornamental red fruit, which is persistent during the winter and attracts birds. If you desire a fast-growing tree, Wilbert Ronald of Jeffries Nurseries recommends Sundancer Poplar. A newer poplar hybrid, Sundancer is disease-resistant and does not produce seed, which is a very important attribute in poplar species, Ronald says. In good soil, Sundancer can grow up to two metres a year. Its mature size is approximately 16 to 18 metres tall and two to three metres wide. Ultimately, the care you give your newly planted tree determines its success. There are no bulletproof tree varieties, but the fact is we need to be planting more trees because trees help fight climate change by sequestering and storing carbon and releasing oxygen. Rather than focusing on planting a single, expensive caliper tree for the instant effect it provides to the landscape, why not consider planting a quantity of smaller trees?